Europe's research ministers are meeting in Lucerne, Switzerland, to decide whether or not to push ahead with plans to land a robot rover on Mars in 2021. The UK-assembled vehicle would search for life on the Red Planet by sampling soil drilled from under the surface. But the project is late, and now needs another €400m (£345m; $430m) to be sure of meeting its launch deadline. 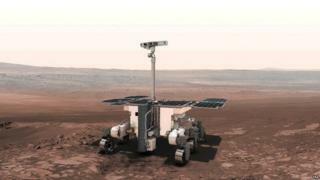 Ministers from the member states of the European Space Agency will discuss the rover’s fate over the next two days. It is not the only topic on their agenda, as they must review a range of programmes valued in total at some €11bn. However, it is probably the most vexing issue before them. The so-called ExoMars rover has suffered chronic organisational problems throughout its development history, and has come close to being abandoned on a few occasions. In May, it was announced that its launch date would slip by a further two years because a number of industrial and scientific teams could not be sure of delivering their hardware on time. A technical review has just concluded that the project is now running true to its new timeline, but the funds needed to keep it that way are substantial. Esa’s director-general, Jan Woerner, has taken a hard line in the run-up to the Lucerne gathering. He has told member states that the only way to proceed with the rover is to give it full and proper financial support. Or none at all. No more "salami funds", as he put it. "Either we do it or we stop it, and I’m in favour of doing it," he told the BBC last month. There are a host of other key decisions to come out of the Ministerial Council covering all manner of different satellite projects. But a few headlines are sure to concern human spaceflight. There will almost certainly be a commitment to stay in the International Space Station project up until at least 2024. This would bring Europe into line with its partners on the orbiting laboratory - the US, Russia, Japan and Canada. However, in the way that Esa budget cycles work, the money released here in Lucerne will only actually cover activities up to 2021. Nonetheless, this would be sufficient to trigger new opportunities for European astronauts to fly to the ISS and for European industry to start building a second "service module" for America’s forthcoming crewship known as Orion. This capsule has been commissioned by the US space agency to take people out into the Solar System to destinations such as Mars. By constructing its propulsive back end, Europe hopes to get seats on board for its astronauts. Esa Ministerial Councils occur every two or three years. In common with similar gatherings in other political domains, many of the issues of contention will have been sorted out by officials in preceding days. But there is sure to be some late, hard bargaining, as member states seek to position their investments in those Esa projects where they think they can get the best return for their industries. Many of the programmes on offer here are optional, and the agency operates a "juste retour" principle. This means that whatever funds nations put into a satellite project, they broadly get back out in the form of work contracts for their home aerospace and technology companies. Much of the speculation ahead of these meetings tends to revolve around the spending power each country might be able to bring with it. In recent weeks, there had been concern that the Norwegian delegation would have its available funds severely curtailed by its government. This worry has now gone away, and it will be making a near-GDP contribution. And there was uncertainty too over whether the UK's financial position would be weakened by the recent fall in the value of sterling following the Brexit referendum. Again, this issue has receded after the Treasury promised currency support to the British delegation. The UK should therefore be contributing broadly what it spent at 2014's Ministerial Council. Note: Esa is a separate legal entity to the EU; and of its 22 full members, two are not in the European Union.